The Slabb: Chocolate with an Adult Twist! 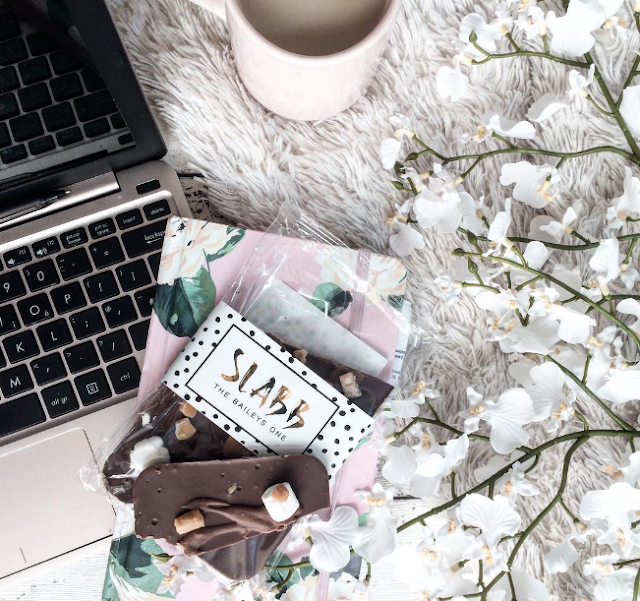 Chocolate is definitely up there as one of my guilty pleasures, particularly so when I'm working in the office or even just on the sofa watching a film. However, it's not often you try chocolate which is different to your usual preference, therefore SLABB is the solution. They recently got in contact with me to see whether I'd like to to collaborate with them and get a sample of some of their loaded chocolate slabs, of course I was going to say yes! Their presentation is next to none, they look almost too beautiful to eat. The packaging is classic and fun with the smart labelling. Everything is left down to the chocolates themselves! I was gifted The Baileys One which is photographed on this post and then the Gin One which I will definitely be consuming soon with a glass of the stuff itself to wash it down with. The toffee and marshmellow toppings to the chocolate really added a great finish to the flavouring, it definitely reminded me of Baileys and would be perfect during the colder months. There is a great selection of various flavours on their website, so there's something for everyone to give a go! The company SLABB are launching themselves through a Kickstarter Campaign which has under a week left, it's inching very close to being funded and I would love it if you could get involved. The chocolates are fun, tasty and great gifts for your family and friends too, I know I'll be looking into them for future gift ideas. Boozy chocolate itself is a must to try out! Keep an eye out for their upcoming launch, it'll be well worth the wait! I will be hosting a few gvieaways with them in the future and can't wait to continue trying out some of their products! *Collaboration with SLABB. All photos and views are my own.